VANCOUVER, British Columbia (CNS) — For Asian Catholics in North America, marking the Lunar New Year can be tricky when the traditional feast falls during Lent, because part of the traditional celebrations include large family meals. This year, Lunar New Year begins Feb. 16, a Friday in Lent. In the greater Vancouver area, home to more than 400,000 people of Chinese origin, Archbishop J. Michael Miller granted a special dispensation to the city’s Asian Catholics, but asked them to keep in mind the Lenten spirit of charity and to pray for ongoing talks between the Vatican and China. 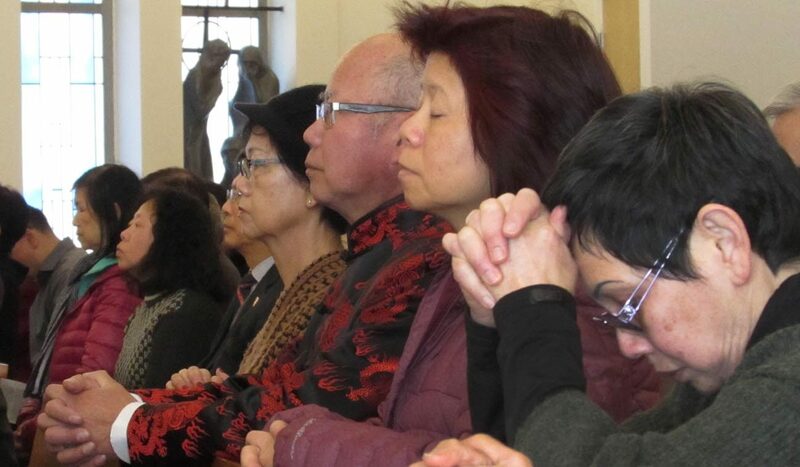 The archdiocese’s Chinese Ministry offered another way for Chinese Catholics to celebrate the traditional festival: a lunar thanksgiving Mass celebrated Feb. 12 by Archbishop Miller, followed by a traditional lunch. Feb. 12 was a civic holiday, Family Day, in British Columbia, and approximately 300 people were able to attend the celebration without missing school or work. During his homily, the archbishop said the ancient celebration offered one more occasion to give thanks to God. He said the Gospel of the day was a reminder that God cares for and provides for all his children, and the faithful were called to trust in his care. Many traditions and greetings during the new year celebrations focus on securing prosperity and wealth for the year ahead. “As we celebrate prosperity and wealth, let us not forget these are matters of secondary importance. How we use these gifts determines our salvation,” the archbishop said. He said there were many traditions attached to the celebration of the Lunar New Year, like visiting a temple to make a food offering for deceased relatives and asking for blessings. Chinese Catholics adapted those traditions, he said. For his part, he said he tried to avoid using the traditional Cantonese greeting “Gung hay fat choy,” which means “congratulations and be prosperous” and other similar traditional greetings, because they were focused on material wealth. Instead he would say “Happy New Year” or “I wish you good health” in hopes his choice of greetings could be an example for his parishioners. At the end of the Thanksgiving Mass, congregants were given red envelopes to take home. Parents, grandparents and married couples traditionally give out red envelopes filled with “lucky money” to children during new year celebrations. Instead, the envelopes distributed at the Mass contained a prayer card and a special blessing for the new year. The Archdiocese of Vancouver established the Chinese Ministry in 2015, though several parishes offered Masses in Cantonese or Mandarin before then. The ministry was established to reach Chinese Catholics unserved by those parishes and reach out to nonbeliever members of the Chinese community. The lunisolar calendar, used for millennia by the Chinese, was believed to date back to the Xia dynasty. It was used to mark the passage of seasons and allowed people to know when to sow and harvest crops. In 104 B.C., Emperor Wu of the Han dynasty fixed the date of the start of the new year as the day of the second new moon after the winter solstice. In 1912, China adopted the Gregorian calendar. The lunisolar calendar was kept alongside the Gregorian calendar to determine dates of traditional festivals.